Skibbereen rowing club has had many significant days in its 47 years of existence and last Saturday 04th November at Áras an Uachtaráin was no exception. President Higgins and his wife Sabina Higgins warmly welcomed athletes, members, supporters and distinguished Olympians of Skibbereen rowing club with enthusiasm and a feeling of celebration. Each athlete was formally introduced to President Higgins and Sabina Higgins – with Donnie Fitzgerald, Danny Murphy and Richard Hosford our founding members also in line. Did they ever conceive when they set up the rowing club 47 years ago that one day they would be standing with their fellow club mates meeting the President of Ireland at Áras an Uachtaráin. It is a true testament to their vision that rowing became an integral part of many people’s lives from a young age. With many of them moving up through the ranks and on to accomplish and collect many outstanding achievements - be it winning domestic regattas, national championships, world championships or Olympic medals. Rowing is now enjoying a new breath of life after the success of the O’Donovan brothers last year at the Rio Olympics and is quickly becoming the number one sport for young people to try and participate in around the country. President Higgins addressed the audience with passion, admiration and encouraged Skibbereen rowing club to keep developing world class rowers. The President noted that in Skibbereen Rowing club’s short life span the athletes have amassed more national rowing championships than any other club in the country, including some that have existed for over a century. “You have’nt been wasting your time” quipped the President to great applause! The President marveled that Skibbereen Rowing club has a large community of people who volunteer and help out – be it family, friends or neighbours all providing nurture and support to all athletes training on the river Ilen. Nuala Lupton President of Skibbereen rowing club and Máire Keating Registar of Skibbereen rowing club responded to the Presidents’ address with kind words and appreciation for the honor and privilage for the invitation to Áras an Uachtaráin. Junior athletes Lorna Nugent and Alan Cotter presented President Higgins and Sabina Higgins with a unique gift from Skibbereen and young Dominc Casey presented the Skibbereen rowing club tie to President Higgins. 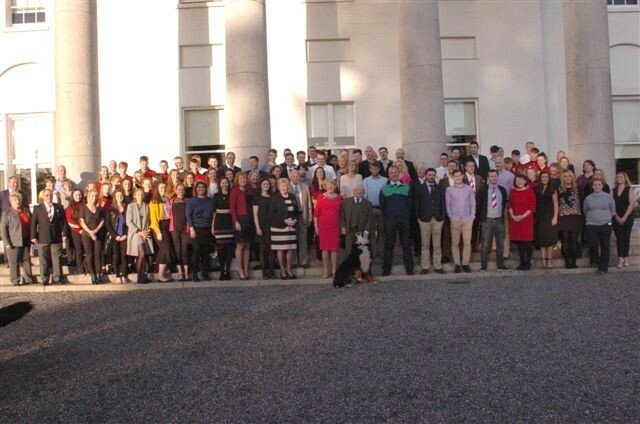 ‘Dear ol Skibbereen’ echoed around the halls of Áras an Uachtaráin thanks to Seanie O’ Brien Skibbereen Rowing club Captain which was a very fitting ending to the remakable day – which will live long in the clubs history and memory. And loud and high we'll raise the cry," Remember Skibbereen!"